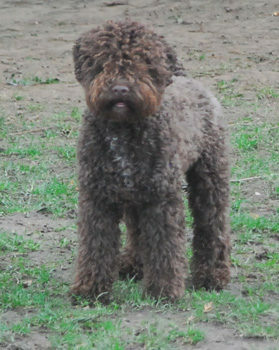 Hurricane del Fatalbecco – Mark Wouters – Lagotto Romagnolo Wasserhunde Deutschland e.V. Brown male born 2013 mai 3th. at Poggini (It), Kennel del Fatalbecco. Furnishing free. Storage disease free. Excellent 1 open class males and CACL. 11/10/2014:  CACIB Charleroi (Be) A. Cuccillato (It). Excellent 1 Intermediate mâles, CAC, CACIB, BOB. Excellent 1 Intermediate mâles, CAC, BOB. 30/08/2014:  CACIB Luxembourg, Biasiolo (It). Excellent 1 Junior mâles, Luxemburg Junior Champion, Benelux Junior Winner 2014. 24/08/2014:  CACIB Mechelen (Be), Rutten (Be). Excellent 1 intermediate class male. CAC, CACIB, BOS. Excellent 1 youth class male. Best youth. 28/06/2014:  German Clubmatch (De) Serena Bernardi (It) 63 Lagotti. Excellent 1 (on 12) youth class male and best youth. Excellent 3 (on 10) youth class male. Excellent 1 youth class male and best youth. Excellent 2 Youth class males.. 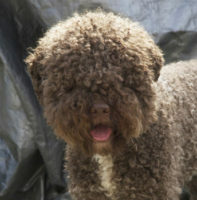 Very Promissing 1 Puppy class males. Very promessing 1 puppy class males. 16 and 17/11/2013: Dubble CACIB Kortrijk (Be).